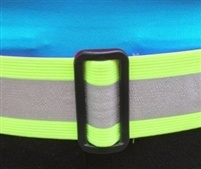 For additional reflectivity and safety choose these high intensity retro-reflective elastic suspenders. Made of 3M™ Scotchlite™ Reflective Material that returns 500 candlepower retro-reflectivity. One size fits most.